TRYPTAMIN lists a wide range of bands as inspiration… NINE INCH NAILS, MESHUGGAH, PINK FLOYD, BURIAL and many more… How did musicians with such diverse tastes in music end up joining forces? Although we have different musical backgrounds, we all like many different music genres and our sound reflects our omnivorous habits. I discovered your band after using terms like ambient, atmospheric, progressive, post-rock, shoegaze and metal. When I heard the song ‘Driver’ it was exactly what I was looking for. How have you managed to incorporate so many genres into one recording? The songs are initially born as “sketches” usually, mostly composed by Pietro (keys and vocals) who records the ideas on his sequencer. Then we arrange the material together. Every member enriches the texture with his own style and ideas. We don’t decide beforehand what elements should be combined in a song, the creative process is very natural and we look carefully after the arrangements and the atmospheres in the tracks. In the past we used to have a more “lengthy” approach to composition: on ‘Monday Hangover’ we streamlined the songs’ structures, in order to make the whole album flowing properly. There is a massive jump in production quality from your first EPs to your ‘Monday Hangover’. Where did you record the album and are you pleased with how it has turned out? The first 2 Eps were recorded live, with a few overdubs and a low budget. Then we decided that the time had come to make “the great jump” so we stay several months in the studio to record our first full length. “Monday Hangover” was recorded and mixed at “Giardini Sonori” Studios, Piacenza, Italy, by Cristiano Sanzeri. The arranging, recording and mixing process was very meticulous, while at the same time we were free to improvise and experiment with effects and instruments. And yes we are very pleased with the result! I like all of the songs on ‘Monday Hangover’ but my favourites are the heavier ones like ‘The Hole’ (awesome song) ‘Water On The Sun’ and ‘Armchair’. which songs are you the most proud of? Every member of the band has his favorite songs from the album, but we are also all proud of Monday Hangover as a whole. Maybe ‘Water On the Sun’ and “Ten Years in One Day” are the songs that represent at best the two sides of our music: the heavy one and the meditative-trippy-romantic one. Although I like the heavier side of TRYPTAMIN, the other songs are still moving like ‘Ten Years in One Day’. I see you’ve been shooting a video for this. What is the theme of it and when are you planning to release the video? The video for “Ten Years in One Day” is based on a time lapse drawing, made by Claudia Valla and filmed by Federico Maccagni and Marcello (guitars) in the end of January 2014. We will probably release it in February 2014. Marcello, you are a video editor by trade, has this worked out well when it comes to making music videos for TRYPTAMIN? I hope that my experience in the field of video production and editing gave good results. As far as I’m concerned, regarding the song “Driver”, definitely yes! I love the ambient/drone outro on ‘Viral’. Who came up with this particular section of music and have they done other ambient music before? The ambient outro on ‘Viral’ (like the one on ‘Armchair’) was made by Pietro during a synth recording session at night, with a bottle of cachaça shared with Cristiano as a strong source of inspiration. Pietro has an ambient solo project called Xebb and composed some ambient soundtracks for theater and short films. Will you eventually make the entire album available to listen on Bandcamp? There are so many good songs on there surely it would be a good thing to do this? Yes, we will gradually upload the whole album on Bandcamp and Soundcloud, following a step-by-step policy. I know it’s early to be asking, but are you already inspired to work on a second album? We have some stuff in progress, at a very embryonic level, but for now we are focused on gigs and promotion in support of ‘Monday Hangover’. I read somewhere that your hometown Piacenza is better known for Pop music. What has the response to your music been like there? Would you consider the band to be a big fish in a small pond? Both a (in our opinion) dull pop scene and an interesting alternative rock scene coexist in Piacenza, ignoring each other. This is pretty usual also in most of the other cities here in Italy. Some very good bands (and friends) from Piacenza are Kubark (the band of our drummer Federico), Le Sacerdotesse dell’Isola del Piacere, Dyskinesia, and Flora. I watched the video for ‘Pocket Journey – Half Plugged @ Bacicca’ on Youtube and and that looked like a great night. I think this was before the current band line-up but if you were there, what was that show like? The show was partially unplugged, with Michael playing acoustic and Marcello playing electric. We changed a lot the arrangement of the songs (our old ones, not those from ‘Monday Hangover’) for that show, and it was a very stimulating creative experience. The line up was the same as today except from the drummer, Bruno Cabrini. We will play unplugged very soon, probably this spring, since this kind of show was very appreciated by the audience. 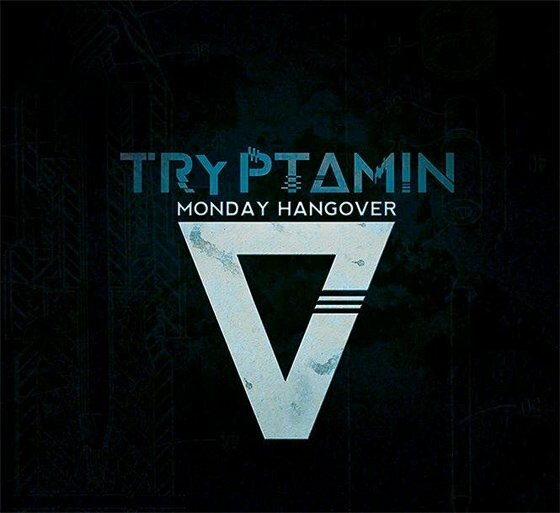 Also few years ago, TRYPTAMIN did a cover of the NINE IN NAILS song ‘Everyday Is Exactly The Same’. This has been removed from Youtube but I wondered if it is still possible to hear it somewhere else? No, at the moment it’s not possible to hear it but we could re-upload it in the near future. The video was taken from the unplugged gig at Baciccia club you mentioned before. Did you have a good time playing at the Tendenze festival last year? Yes, it was a good time for us, also because it was the album premiere and we sold a lot of records compared to other gigs, which is surely a good thing. Tendenze Festival occurs every September in Piacenza and it’s a great way to hear some good music and meet nice people. Are you planning on touring outside of Italy? At the moment we’re not planning a tour, but probably we’re going to do this for next autumn. We played in the Netherlands 4 years ago and it was great. Where do you hope being in TRYPTAMIN will take you in the future? And what are your plans for the rest of this year? We hope to spread our music as much as possible, by means of both live gigs and shared content on the internet. Soon we’ll set to work on some new music, maybe to be released as an EP, as well as on and a new videoclip. Many thanks for the interview, cheers!